Philippe Halsman, Astonish me!, an exhibition at the Elysée Museum in Lausanne, sheds a new light on a darling of the post war iconography and inventor of jumpology. His pictures of celebrities and prominent personalities are so well known that they would make an instant crowd-pleasing show. Who would not revel in images of Marilyn Monroe as she demurely hides her hands behind her back with a beguiling smile? 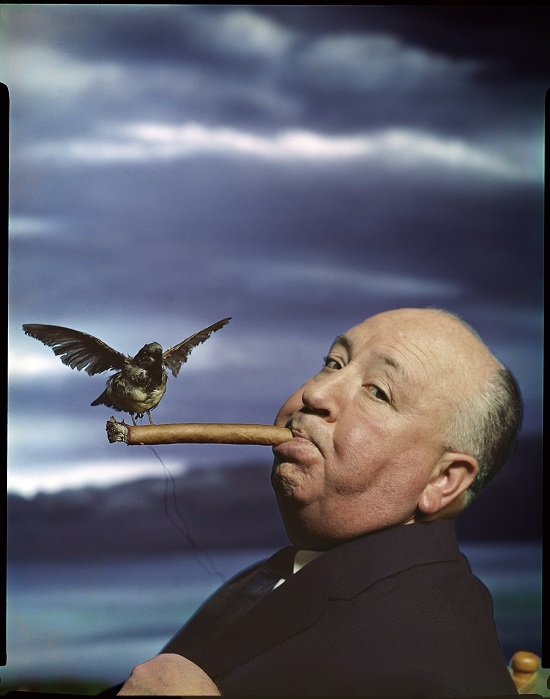 Or Alfred Hitchcock promoting his legendary film The Birds with a winged creature landing on his long cigar? “We did not want to just display Halsman’s 150 iconic images, we wanted to highlight the creative processes that he used to make them,” Stourdzé said. The Elysée show, he indicated, presents Halsman as one of the first photographers in history to have considered and used his medium as art. His work is also permeated by an immense joie de vivre, which Stourdzé suggests may have been the expression of resilience of a Latvian Jew born at the beginning of the last century and who directly experienced the rise of anti-Semitism (see infoboxes). “He had a deep need to connect with people,” confirmed Irene Halsman, the photographer’s first daughter. With several other members of the family, she had arrived from the US to attend the opening. “We have never had a show like this that retraces his entire career. You can really get a feel for Philippe, for his sense of mystery and delight,” she told Swissinfo.ch. Over 50 years until 1979, Halsman used his technical ingeniousness and natural mischievousness as sources of constant experimentation. “His sense of irony is everywhere,” Irene Halsman observed. Discovered in a trunk that made its way to the US several years after Halsman escaped from Nazi-invaded France and that is still in possession of the family, non-archived material has surfaced from the beginning of Halsman’s career in Paris in the 1930s. The trove of documents, that the Elysée has analysed and presents for the first time, lends credit to Stourdze’s claim that Halsman was one of the first photographers to use photography as art. From 1931 to 1940, Halsman lived in Paris where he established his reputation as a portraitist who could seize the invisible. “He invented the photographic interview,” said Elysée curator, Anne Lacoste. André Gide, Le Corbusier and Marc Chagall were among the artists and intellectuals whom he immortalized. Lacoste also pointed out that the rising consumerism of the years between the two wars was nurtured by the birth of magazines made possible by the development of offset printing. Halsman contributed regularly to popular publications such as Vogue, Vu and Voilà, but his work was also exhibited in an avant-garde venue, Galerie de la Pléiade. “We hadn’t understood the importance of his work in Paris,” admitted son-in-law Steve Bello, who was married to Halsman’s late second daughter, Jane. “We thought he was still learning his craft, but in fact, he had already established his style and technique. He had more work published in France than we realized,” said Bello as he inspected the Lausanne show. In 1940, Halsman’s career in Paris ended abruptly with the Nazi invasion. His wife Yvonne Moser, a French national and accomplished photographer in her own right, and their baby daughter Irene, fled to the US, followed six months later by Halsman, whose Latvian passport had kept him behind. 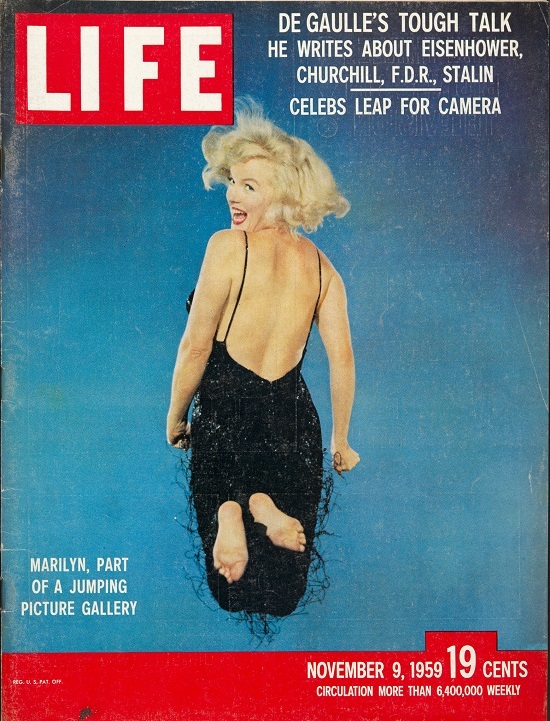 It wasn’t long before Halsman was making fashion shots in New York and his first cover of Life. By 1944, he was travelling to Hollywood to photograph Bogart, Bacall, Sinatra, Ingrid Bergman, Bette Davis and Judy Garland. In 1949 he was asked to cover emerging starlets. 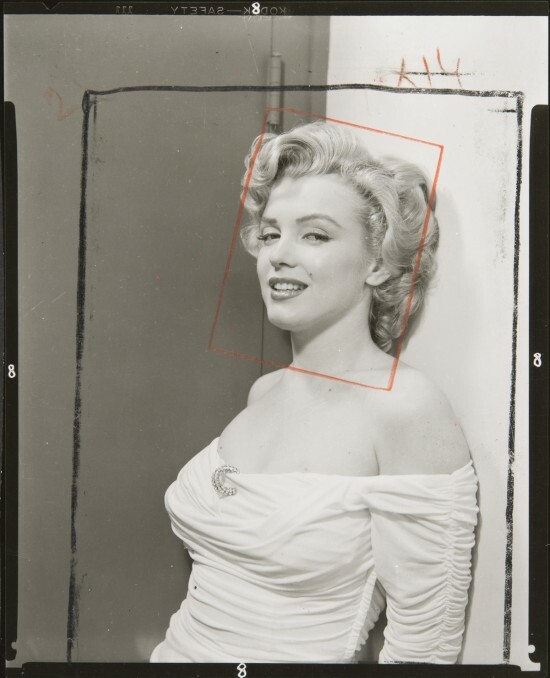 Marilyn Monroe, he recalled, had a natural ability to flirt with the camera lens. Another highlight is The Frenchman, made with the putty-faced French comic star Fernandel in 1948. Halsman pretends to be a puritanical female journalist who asks a series of questions to which Fernandel responds silently with facial expressions that leave no doubt to his answers. One of the questions is: What measures are being taken by the French government to raise the birth rate? Along the way, Halsman had progressively invented jumpology, the art of capturing his subjects in mid-air. He discovered how they became themselves when attempting to defy gravity, each one of them unveiling an aspect of their character hitherto hidden from the camera. 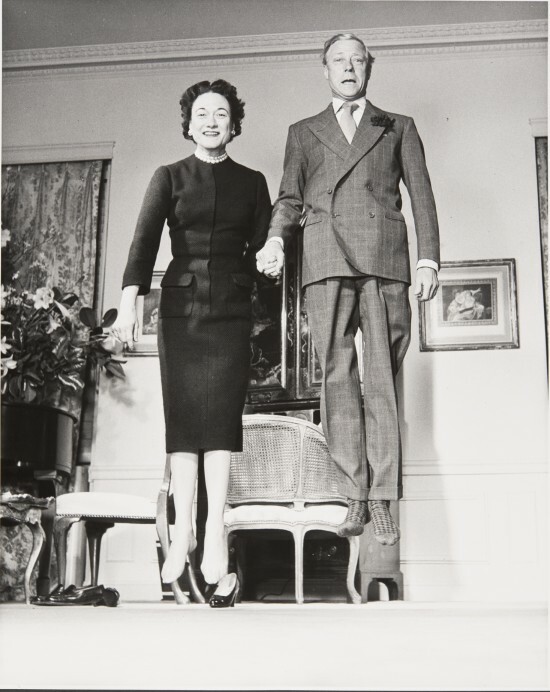 Richard Nixon, Audrey Hepburn, the Duke and Duchess of Windsor, Orson Welles, Brigitte Bardot and countless others revealed themselves in unexpected ways as they struck their levitated poses. Halsman’s technical background as an electrical engineer, combined with his unbridled imagination, resulted in endless experimentations. He pioneered the use of flash, including with a stroboscope, favoured unorthodox angles, invented a 4 x 5 camera box to make bigger and more precise pictures and became a master of photomontages. “This was before Photoshop,” Irene Halsman, said with amusement. A collaboration with Salvatore Dali over 30 years was an especially creative one. The two outmatched each other in outrageousness. Both men were interested in science and together they staged elaborate mises-en scène of flying cats, melting faces and Dali’s moustache growing out of cheese. From a man reputed for the seriousness of his work in fashion, politics and film, this side to Halsman did not always go down well. Halsman liked to have the last word, Irene Halsman mused. She told Swissinfo.ch about the Ping-Pong table in the living room: Halsman would get upset if he didn’t win. Halsman first met Salvador Dali in 1941 and for the next 35 years they worked together on projects that brought out the delirious imagination in each other. In photo sessions that could last for days in a studio that resembled a movie set, they would tirelessly repeat the motions to establish the perfect shots that would then be melted into a single image. In Dali Atomicus, Halsman and Dali, who were both interested in science, explored the laws of suspension. 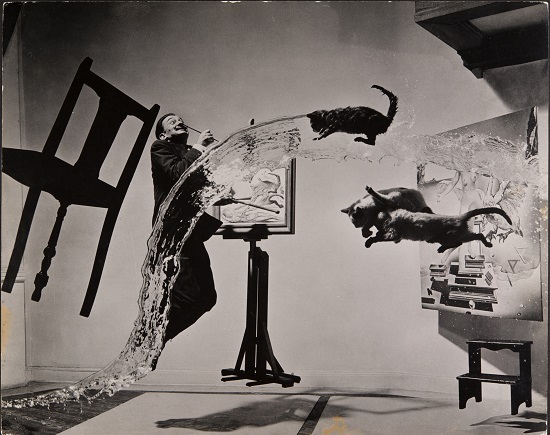 It was published by Life in 1948, along with trial shots, and became the iconic image of the collaboration between Dali and Halsman. The Philippe Halsman archives are held by Irene Halsman Rosenberg, her son Oliver Halsman Rosenberg and Steve Bello. The exhibition is curated by Anne Lacoste and Sam Stourdzé, assisted by Lydia Dorner and Camille Avellan. The title of the exhibition at the Elysée Museum is a catchphrase that Halsman borrowed from Serge Diaghilev and that he used all his life. It was the Russian ballet master’s answer to a young Jean Cocteau eager to work with him and who wanted to know what he should do. “Astonish me!” was the answer. When photography was invented as early as 1840 and popularized 50 years later, painters were convinced that their livelihood had come to an end because figurative art was no longer needed to depict reality. Instead, it was the beginning of abstract art when Sonia and Robert Delaunay, as well as Kandinsky, started at the beginning of the 20th century to paint compositions without a recognizable form. Halsman’s early portraits made in Paris during the apogee of the Surrealist movement already revealed a keen sense of artistic experimentation which was significantly expanded during his 30 year-long collaboration with Dali. By straying away from reality, Halsman allowed photography to build a bridge between fine arts and popular culture. Born in Riga, Latvia in 1906, Halsman intended to become an engineer. He became an early victim of anti-Semitism when he was falsely accused in Austria in 1928 of the accidental death of his father on a hiking trip. Following a year of solitary confinement, he was released due to the international outcry of a committee, rallied by his sister Liouba, that included Thomas Mann, Sigmund Freud and Albert Einstein. In 1940, Einstein was to intercede again with the help of Eleanor Roosevelt, to allow Halsman entry into the US despite his Latvian passport. Humphrey Bogart, Lauren Bacall, Frank Sinatra, Ingrid Bergman, Bette Davis and Judy Garland, Winston Churchill, Henri Matisse, Jean-Paul Sartre, Brigitte Bardot, Chagall, Pablo Picasso, President John F. Kennedy, Robert F. Kennedy, the playwright Edward Albee, Eleanor Roosevelt, the photographer Weegee, Alfred Hitchcock, Vladimir Nabokov, President Richard Nixon, Woody Allen, Mae West, Audrey Hepburn, Angelica Huston, Grace Kelly, Rita Haywoth, Sammy Davis Junior, Cassius Clay, Gloria Swanson, Vivien Leigh and Laurence Olivier, Martha Graham, Bobby Fisher, Andy Warhol, J. Robert Oppenheimer, Peter Ustinov.